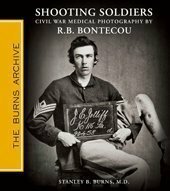 A significant new chapter in Civil War history is revealed with this first exposé of the war-time clinical photographs of Dr. Reed Bontecou. Shooting Soldiers: Civil War Medical Photography by R.B. Bontecou, is a revealing exposé of the war-time clinical photographs of Reed Bontecou. The war has been under writers' and scholars' microscopes for the past 150 years and there are few significant things yet to be uncovered of general interest. The subject of this book is one of them -clinical photography during the war - and the images are artistically posed in the style of the masters of photography. This is the first volume of a series showcasing the Civil War carte de visite (CdV) photographs of Reed Brockway Bontecou, MD, Surgeon-in-Charge of Harewood U.S. Army General Hospital, Washington DC. The book contains 102 plates of wounded soldiers and 50 other medical photographs that vividly document the distinction between clinical photographs taken during the war and the post war images made for pension purposes. Also included are discussions of death and sacrifice as well as listings of the soldiers presented with their units, battle, and official accounts of their wounds. Shooting Soldiers… is a necessary addition to every war, medical and photography library as it contains valuable information and images not available from any other source and it is sure to become the standard reference in the field.